A Netflix broadcast release on December 13. Inside Llewyn Davis, the new Coen Brothers film, will be coming out in Canada on December 20. Set in Greenwich Village in 1961, it imaginatively evokes an era when folk music reigned supreme for artists, intellectuals and progressives living in the US and, to some extent, Canada and England. While audiences are awaiting the film, which won the Grand Prix at Cannes and stars Justin Timeberlake, Carey Mulligan, John Goodman, and in the title role, Oscar Isaac, Another Day/Another Time: Celebrating the Music of Inside Llewyn Davis is being released a week earlier. While the film has short interviews with Marcus Mumford, Oscar Isaac and other musicians and does show rehearsals, the majority of the footage was shot during a major concert, which took place at The Town Hall in New York City on Sunday, September 29, 2013. It featured live performances of the film’s music, including such iconic tunes as 500 Miles, Hang Me Oh Hang Me and Fare Thee Well as well as other songs that were popular in the early 1960s. Artists including the Avett Brothers, Joan Baez, Dave Rawlings Machine, Rhiannon Giddens, Lake Street Dive, Marcus Mumford, Punch Brothers, Patti Smith, Gillian Welch, and Jack White, as well as Oscar Isaac appeared on stage. The film has numerous highlights including Patti Smith singing Babe I’m Going to Leave You, Joan Baez performing Joe Hill and Gillian Welch delivering a wonderful Will the Circle Be Unbroken? with Dave Rawlings. Zoomer audiences will remember the huge success of the soundtrack for the Coen Brothers’ O Brother Where Art Thou 13 years ago. 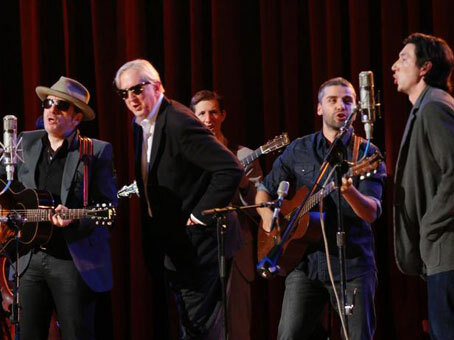 Once again working with T Bone Burnett as a producer, the Coen Brothers are reviving great American music in Inside Llewyn Davis and this terrific concert film.